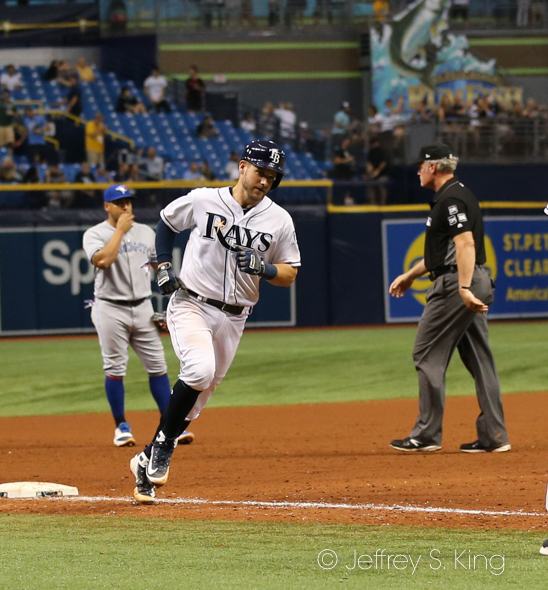 As they limp toward the finish line, beaten and battered, this remains for the Tampa Bay Rays. What about getting better for next year? Despite of having a better-than-expected season, there is still room for improvement for a team that has won just three times in its last nine games. The Rays lost to Toronto Friday night, 7-6, and along the way, demonstrated some flaws that need correcting. For instance, there was pitcher Tyler Glasnow, who manager Kevin Cash points out "has wipeout stuff." But Glasnow is just 1-5 in his time with the Rays, and his ERA is over 4.00. There is some tightening up that needs to be done. For instance, there is first baseman Jake Bauers, who started off as a dependable hitter. But he ended the night hitting only .194. For instance, there is shortstop Willy Adames. Adames is hitting .271, which isn't a bad rookie year, But Adames was hitting just .200 going into August, which means he needs to be more successful. For instance, reliever Jose Alvarado at times looks like the team's closer of the future. Then comes a night like Friday when he can't find the plate. Cash, as usual, was more concerned with Glasnow's walks than the home runs he gave up. Alvarado had a tough night for the Rays and took the loss. Mallex Smith had three hits for the Rays. Adames, Austin Meadows and Adam Moore had two hits. Moore hit a home run that was his first in the major leagues since 2012. Meadows ended the night with the tying run on base when he swung at a 3-0 pitch and fouled out. "I wanted him to (swing)," Cash said. He’s got a chance in my opinion to hit the ball out of the park. (Ken) Giles is so tough on anybody. How many pitches are you going to get you can do damage with? He put himself in position." The Rays need to win their last two games if they are to finish with 90 wins for the sixth time in 11 seasons. Blake Snell, one of the leaders in the discussion for the Cy Young award, pitches against Rich Borucki. The game begins at 6:10 p.m. at Tropicana Field.